First, let me say “thank you” for the great campaign you ran. You guys are great. I’ve eaten my nails for you, I’ve given my money to you, I’ve donated my time to you, I voted for you, I cried for you. But here’s the deal. I lost a lot of sleep over you people, not to mention a lot of billable hours. In these troubled times, this wasn’t wise. But I couldn’t help myself. Spurred on by fear, love, loathing (you can guess which one of those is for you) I emptied my pockets for you on a few occasions, as did many of us. As misguided as my thinking was that Sarah Palin would go away after the election, so was the idea that my Yahoo in-box would cease to be filled with your emails. I mean, we won, after all. You do know that, don’t you? Yeah, I know the real work is only just beginning. Aware as I am of your vast network of foot soldiers who can’t afford to stop working just because you were victorious, I, nonetheless, didn’t expect the volume of communications to continue as they have been. A note here and there just to keep the peanut gallery informed is welcome. But here’s the problem, you guys keep shaking me down for cash. Every time I think you’re just reaching out for a little chit chat, I feel used when I scroll to the bottom and see that you still want my money, the red “donate” button conveniently not visible till I’ve already been sucked in. By now, I should know better. Your online survey the other day was a great hook. Trying to fend off my cynicism, I dutifully answered all the questions, admittedly proud to know you wanted my opinion on how you should govern. It hadn’t occurred to me that at the end you would ask me for money again. To my surprise you asked only for the humble amount of $5, except that once I clicked on “donate” the lowest amount available for selection was $25. Of course, I wasn’t going to put $5 in the “Other” category. I imagined your staff on the other end snickering at my frugality. So I gave you $25. I’m inclined to believe that it was this donation that entitled me to advance to the next level of your survey, kind of like a video game for political geeks. You let me expound on my greatest fears and hopes for our country. I’ll never know whether it was my donation that allowed me entry into level two of the survey. You guys are too smart not to realize that we want a return our investment. This is more than we can say for the bailout. What’s up with that thing anyway? 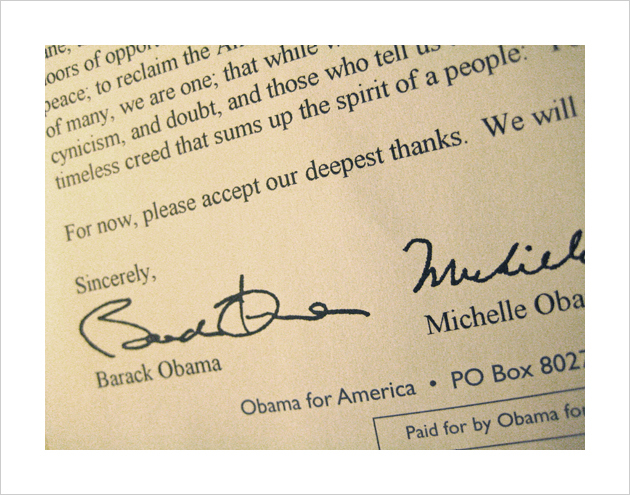 So, it was with unbridled delight today when I thumbed through my mail and saw “Barack and Michelle Obama” in the return address–only a name, no address. You are in between addresses, after all. Sure, the envelope was barcoded and form-letter looking, but inside was a thank you letter. Just a thank you and nothing else. I peered into the envelope three more times to look for the telltale donation envelope. Not there. I shuffled through the stacks of catalogs wondering if I’d absentmindedly mixed the donation envelope in with the rest of the junk mail. Nope, nothing. Just a thank you. And for that, I thank YOU. Now, you got any money I can borrow?